BACKGROUND: Centralised multidisciplinary management of breast cancer occurs in KwaZulu-Natal, South Africa, and requires a diagnostic and staging pathway at the referring hospital. Delays in this pathway are unknown. This study, conducted at a referring hospital, R K Khan (RKK), quantifies and analyses these delays. METHODS: A retrospective folder review included all patients with breast cancer diagnosed at RKK from January 2008 to January 2009. Data extraction included demographic data, time to diagnosis and initial staging using a standardised data sheet. Specific care steps were identified, namely delays to initial imaging with mammography, pathology confirmation, staging work-up and eventual referral to a centralised breast clinic. RESULTS: A total of 45 patients were included (43 females and 2 males). The average age was 56 years. The mean individual care step delays were 18.3 days to initial imaging, 21.2 days to pathological confirmation, 9.2 days to initial staging and 22.7 days to review at the centralised breast clinic. The delays were sequential, with a mean total delay of 70.1 days or 10 weeks with an interquartile range of48 - 82 days. CONCLUSION: This study confirmed significant delays in the care pathway, which are almost double the international recommendations of 6 weeks. Steps to reduce delays at all phases have been instituted with specific care step targets leading to the establishment of a breast cancer registry with an audit capability. We suggest targeting an 8-week period for the work-up and staging of every patient with breast cancer. The establishment of a breast cancer registry and regular audits thereof are essential in maintaining care standards and achieving best practice. In South Africa (SA), breast cancer is the 4th most common cause of death from all malignancies. In SA, we notice a discrepancy in incidence rates between various ethnic/race groups. African women have rates similar to those in other developing countries. Caucasian women have rates that are comparable with industrialised countries and are among the highest rates in the world. In women of Indian origin the rates are almost double those reported in India. In most developing countries, including SA, breast cancer initially comes to the attention of the general surgeon, usually at a secondary level hospital, where the diagnosis is confirmed and surgery is performed. An oncology opinion is usually sought in the postoperative period. This system is changing and multidisciplinary teams (MDTs) are being formed to manage breast cancer. These teams involve surgical, oncology, radiology, pathology, nuclear medicine and plastics disciplines. The MDTs consider the treatment options and patient preference before deciding on appropriate management. Such a system has evolved in the Durban Metropole based at Inkosi Albert Luthuli Central Hospital (IALCH). This is not an open-access breast service and requires a diagnostic and staging pathway at the referring hospital. 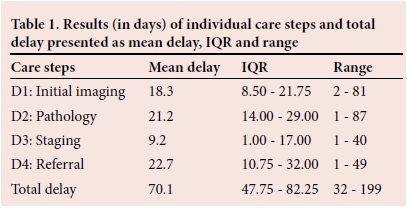 This study conducted at a referral hospital, R K Khan (RKK), quantifies and analyses these delays. The primary objective of the study was to quantify the total time delay between initial presentation at RKK and eventual review at the multidisciplinary breast clinic at IALCH. The secondary objectives were to document the time intervals between specific care steps, identify the reasons for these delays and propose policy change to improve the situation. RKK is a regional hospital and services a population of approximately 1.5 million people. Around 60 new breast cancer cases are diagnosed annually in the surgery department. A retrospective folder review included patients with histologically proven breast cancer seen at RKK and referred to the MDT at IALCH from January 2008 to January 2009. Patients were excluded if they were admitted for work-up and management or if folders were inaccessible for data collection. The care pathway timeline is illustrated in Fig. 1, which shows the experience of the average patient at this referring hospital. The initial consultation was followed by a delay to the mammography/ultrasound (D1 -initial imaging delay). At the second visit the mammography or ultrasound was reviewed and a biopsy performed followed by a delay awaiting histology results (D2 - pathology delay). The third visit consisted of confirming these results and booking a metastatic work-up including an abdominal ultrasound, chest radiograph and liver function tests (D3 -staging delay). Finally, the fourth visit reviewed these investigations and a multidisciplinary breast clinic appointment at IALCH was booked (D4 - referral delay). This was the best-case scenario, as some patients would require repeat biopsy or additional radiological investigations leading to further delays. Demographic data captured during the folder review included age, gender and address. A timeline was generated for each case by capturing dates of the first consultation, mammogram, histology report, abdominal ultrasound, chest radiograph and IALCH multidisciplinary breast clinic. The individual care step delays were quantified and any reasons sought to explain excessive delays were noted during the folder review. Data analysis was conducted using SPSS for Windows, version 15.0 (Chicago SPSS Inc.,USA). Quantitative data including time in days between dates of entry and exit from the cohort and between intermediate dates have been summarised using mean delay and interquartile range. The cohort included 45 patients with 43 females and 2 males with a mean age of 56 years. The mean delay, interquartile range (IQR) and range are illustrated in Table 1. These delays were sequential, with referral delay being a week longer than the others. If we combine all radiology-based delays, i.e. D1 and D3, it totals 27.5 days, which is the longest delay and underscores their importance in breast cancer services. The pathology delay (D2) was 3 weeks with six patients requiring multiple biopsies to confirm the diagnosis. The final phase of delay (D4) was referral to the MDT breast clinic, which averaged 22.7 days. This led to a mean total delay of 10 weeks, with nine patients who waited over 3 months. This study confirmed significant delays in the care pathway for breast cancer at a regional hospital. An appropriate delay remains a challenge to quantify due to lack of an evidence base. Current guidelines are derived from consensus statements and experience gained largely from well-resourced, publicly funded health systems in Europe and North America. [3-8] The delays in these studies are tabulated in Table 2 and provide some perspective when interpreting our results. It is easy to appreciate that none of the studies conform to standardised reporting of delays. The average delay was 5 - 6 weeks for most patients, which is half our delay. It is important to note that some of the studies do not have full datasets, thus preventing direct comparisons. These audits provide an insight into the delays in other health systems and serve as guidelines in determining an acceptable delay. In 2010, the European Society of Breast Cancer Specialists published an updated position statement on quality indicators in the management of breast cancer. Their recommendation is a waiting time of less than 6 weeks from initial diagnostic visit to definitive treatment. This time frame has to be achieved in at least 75% of patients as a minimum standard. In the UK, waiting times in the National Health Service (NHS) are constantly in the spotlight. In 2000, the NHS Cancer Plan was published in which the Labour Government pledged to spend GBP10 million per annum to decrease all cancer waiting lists. A 2-week rule was introduced specifically in the management of breast cancer. All patients with suspected malignant breast disease had to be seen at a specialist clinic within 2 weeks. A timeline for further work-up of patients or intervention was set at a further 4 weeks, providing a total delay of 6 weeks. A follow on from the NHS Cancer Plan was published in 2007 called the Cancer Reform Strategy. Breast screening was extended to ages under 50 years and over 70 years, with all patients with breast cancer symptoms to be seen within 2 weeks. These guidelines have been successful in improving waiting times, with 99.2% of patients with breast cancer starting treatment within 1 month of diagnosis. The underlying concerns with these delays are whether they correlate with an increased mortality. A meta-analysis by Richards et al. in 1999 analysed 87 different studies looking at delay and mortality in breast malignancy. Their findings suggest that delays exceeding 3 months were associated with an increased mortality rate.l14] A more recent article gathered information from the National Cancer Registry in the UK and found a median delay of 22 days from diagnosis to treatment. In contrast, they found no difference in mortality in patients who waited more than 25 days. The consensus is that an acceptable delay is less than 6 weeks from first presentation to commencement of treatment. In comparison, our service showed a 70 day/10 week mean delay. This is difficult to compare with the guidelines discussed above as the end points differed. In our study, our patients were seen at a MDT breast clinic within 10 weeks, but were no closer to definitive treatment by that stage. We did not discuss patient delay from time of symptoms to first contact with the health system as we were unable to quantify this accurately. The study had further limitations in that it was a single centre review with no comparative data and relatively small numbers. The initial imaging delay (D1) involved accessing a mammogram and/or an ultrasound of the breast. At most regional level hospitals in SA there are limited radiology and mammography services. This study site had a full-time radiologist reporting on all mammograms, and yet the radiology delay was a major concern. The staging delay (D3) included the delay to an abdominal ultrasound, chest radiograph and certain blood tests with the rate-limiting step being the abdominal ultrasound. If we combine these delays (D1 and D3) they total 27.5 days, which is the longest delay. The single radiologist has an overwhelming workload, contributing to the delay. The pathology service is a vital component in our breast cancer service, as histology remains the mainstay of diagnosis. In certain instances the specimens were inadequate and this reflects the experience of the clinician performing the biopsy. The surgical clinic was staffed with a variety of medical personnel from surgeons, registrars, medical officers and interns. The junior staff would invariably have a higher rate of inadequate sampling. They were also more likely to repeat the biopsy without escalating to an image-guided biopsy. The second component of this delay relates to the delay in processing and reporting the specimen at the pathology laboratory, which services the entire province and has staff and resource limitations. Having identified these delays, meetings were arranged with all the major stakeholders including the radiology and pathology services. We sensitised them to our concerns regarding the delay and welcomed feedback and logistical changes to improve the service. All parties were keen to use this research to motivate for additional funding and staff and indicated the need for regular audits of the service. In the surgical clinic, a focal liaison was identified that would expedite the referrals of all our patients with breast malignancy to the MDT breast clinic. Protocols were also agreed upon to minimise unnecessary mammograms, thus alleviating the workload on the radiology department. In patients who had obviously suspicious mammograms the radiologist would expedite the metastatic work-up by doing the abdominal ultrasound at the same time, thereby decreasing the delay. The data suggest that a central, open-access breast clinic might be better suited to decreasing the delay and improving overall care for these patients. Anecdotal evidence exists in the South African setting that this type of service decreases delays in the work-up of breast malignancy. There are no guidelines regarding acceptable delays for breast cancer in resource-poor settings. We have attempted to set some norms for acceptable delays based on data generated in this review. The recommendations in Table 3 would need to be achieved in 75% of patients as a minimum standard. The establishment of a breast cancer registry is essential in ensuring timeous management. The registry can be the responsibility of an experienced nurse and the process overseen by a clinician with experience in the management of breast cancer. Regular and ongoing audits of the system are imperative to ensure minimum standards are achieved. Breast cancer remains a major public health concern, testing our healthcare model in SA. The discussion around acceptable and attainable system delays is important and needs input from all stakeholders responsible for managing this disease. We look forward to further research and developments on this topic.